Students who major in biotechnology train to do the research that will improve health care and the environment. You will learn about the role genetics plays in shaping the future of medicine, health care and food production. This degree prepares you for immediate job placement in the biotechnology industry for advanced fields of study in the molecular biology revolution. You will put your interest in modern biology into practice as you learn to grow cells in a dish and perform gene analysis and genetic engineering. 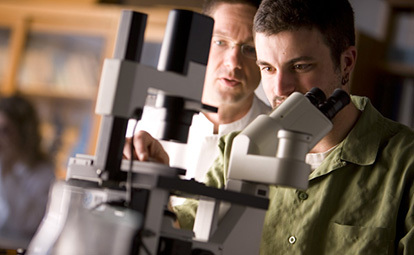 Strong base of scientific knowledge established through biology, chemistry and physics courses. Opportunity to participate in field-based or laboratory-based faculty research on a short-term or long-term basis that may culminate in publishing papers and presentation at scientific conferences. High-demand for graduates who complete advanced work. Biology Tutoring Center positioned near a new anatomy and physiology suite is open weekdays. Collaboration on the Integrated Science and Engineering Laboratory Facility (ISELF) molecular mechanisms of disease research. Preparation for professional study programs required for careers such as virologist, microbiologist and biochemist. Discovery-based research externally funded by the National Science Foundation and the National Institutes of Health. Assisstant Professor Brian Olson's National Institutes of Health-funded research uses human cells in culture to discover molecular mechanisms that regulate human proteins involved in Parkinson's Disease, Huntington's Disease and obesity-related diabetes.